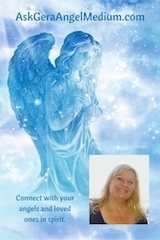 Archangel card- Archangel Michael: Crystal-Clear Intentions. Archangel Michael wants you to know that it is very important to have crystal clear intentions in everything you do, think or say. Now more than ever, with so much light coming to the planet and present around us, our thoughts manifest much more quickly into things. These thoughts we have, whether positive or negative, attract to us what we think or speak about most often. For example, if you worry constantly about your finances, about not having enough money for bills, mortgage, rent and food, you are putting energy into thinking about your potential “lack” of enough money. This energy then hovers around you in your energy field, and attracts like energies-other people who have fears of lack and worry about it, situations where you don’t have “enough” of something, and more thoughts of the same, until it’s a never-ending cycle of lack in your life. Once you realize what these thoughts are creating, you can set an intention to change what your thoughts and feelings are when it comes to this subject. This is the first step to creating change in your life: setting an intention. But setting an intention and following through with it are two separate things. Have the integrity to follow through on your intentions. You owe it to yourself. Do it full out, not halfway. And be very clear about what intentions you set. Get detailed. Know in your heart what you want, what you desire. It’s helpful to write down what you want, to make a list. This gives your thoughts even more energy and clarity. When you know clearly what you want to create, what you desire in your life, and set clear intentions to create it, the angels step in to help you. They assist you in bringing into your life those people, situations and events that help to create what you want. I have noticed for myself that this occurs in steps or stages, not as a full blown manifestation of my dream. Instead, I meet someone or read something that can help me or give me the guidance I need to take the next step, to take action, in the direction of my dream. And it seems these people or this information just show up in the right place at the right time! That is the magic the angels can bring to your life. Now that you know you can manifest with the angels by setting crystal clear intentions, it’s important to keep the faith. Believe that your prayers are already answered, that your gifts are on their way to you. Be strong in your faith that this is happening, do not waiver. Oh yeah, we all have doubts at times, especially when things seem to be going slowly and it’s taking forever…but, these are the times to catch yourself and watch your thoughts. Try not to slip into negativity or doubt for too long. Get right back to your positive place as soon as you are able. Be diligent about catching yourself. Make this a habit. Forgive yourself for being human, having an ego and doubting. And then get back into that “zone” where you are happy, positive and optimistic, especially about your dreams. I have been using these techniques more and more often in the past eight months myself, and what a difference I have noticed! I am much happier in general, and am manifesting the right people, information and guidance I need to move forward. It’s been a lot of fun to watch things unfold. I look forward to more fun unfolding and I wish the same for you. Simply wish to say your article is as surprising. The clarity in your post is simply excellent and i can assume you are an expert on this subject. Well with your permission allow me to grab your feed to keep up to date with forthcoming post. Thanks a million and please keep up the rewarding work.